TOPEKA METRO VOICE CLASSIFIEDS: Payment in advance required by check or credit card: $12 for the first 25 words; 25 cents for each add’l word. Email your ad to Voice@cox.net; mail to PO Box 5724, Topeka, KS 66605; or call 785-235-3340 to arrange credit card payment. PayPal can be used by sending payment to Voice@cox.net. ANNUAL GARAGE SALE – Apr. 7 & 8, 8am-12noon., First Christian Ch., 1880 SW Gage, (enter from 19th and Stone). Antiques, kitchen ware, games, books, puzzles, electronics, Christmas, furniture, something for everyone. Proceeds used for community and youth activities. Sponsored by Seeker Class at First Christian Church. harmonies. Come be our guest any Monday night at 7:00 p.m. at Seaman Community Church, Fellowship Hall, 2036 NW Taylor, Topeka, Kansas. Topeka Acapella Unlimited is a Chapter of Sweet Adelines, International. Call Cindy Patton at 785-640-7403 for more information. WANTED: PART-TIME ACCOUNT REP – Work your own hours. Call on businesses, churches and non-profits about their advertisements in Metro Voice. Generous commission on all ads you place; no base. 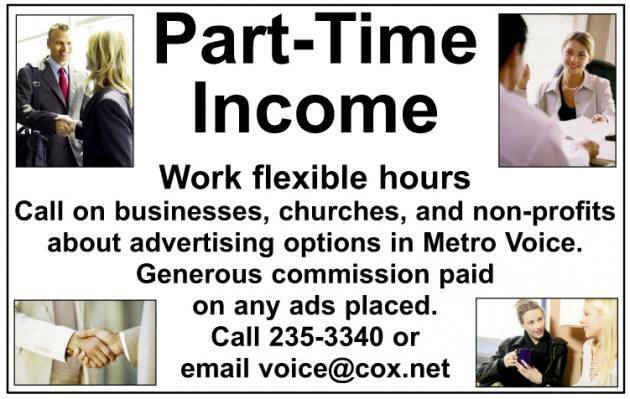 Call Metro Voice at 785-235-3340 or email Voice@cox.net. WANTED: MINISTRY STAFF – Topeka Rescue Mission’s Children’s Palace needs qualified ministry staff to minister to homeless children and their families. Must be ministry-minded with a strong passion for Jesus and children, and have previous experience working in the field of early childhood education. For a list of positions & qualifications needed, visit trmonline.org. Send resumes and/or inquires to jhosman@trmonline.org or call 785-730-8802. WANTED: VOLUNTEER WRITERS – Metro Voice needs volunteer writers or interns who can serve as area correspondents for church and community news around the metro area. Call 235-3340 or email voice@cox.net. Some perks involved. WANTED: DELIVERY PERSON – Metro Voice needs someone to help distribute papers to churches and other locations in Topeka, a couple days a month, using your own car. Call 785-235-3340 or email voice@cox.net. FOR SALE: GOLF CLUBS – a 2013 model Cleveland Driver SL 290, 10.5 Degree, regular flex shaft. Retail $339, asking $49, only played a few rounds. New Warrior 10 degree Driver, only hit a few at the range with it, $49. Call 785-640-6399. FOR SALE: MOBILE HOME – 2BR/2BA, $8900. Price reduced from $12,900! 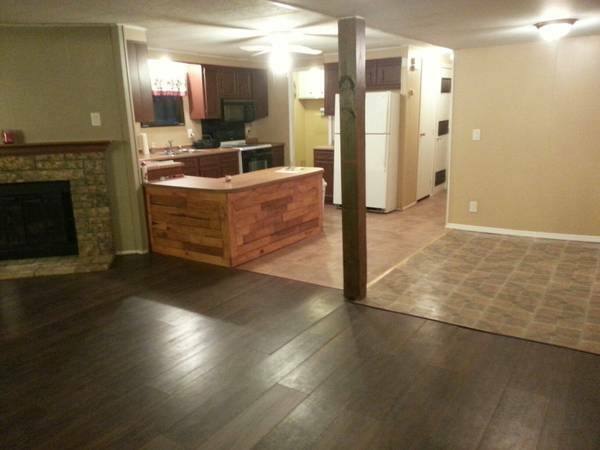 A very nice 2 BR, 2 bath, remodeled & upgraded Mobile Home with 8′ X 22′ add-on to make a large living/dining area! 1100 sq. ft. Open floor plan, ceiling fan, wood-burning fireplace, refrigerator, dishwasher, storage building with electricity, double carport, large covered front porch/patio. Separate utility/laundry room. Near 45th and Adams: 783 SE Ridgeview Dr – located in a very nice, clean, friendly South Topeka manufactured home park with neighborhood pool, club house, park area/playground for children and storm shelter (Ridgewood Estates), community activities, with a park across the street. Shawnee Heights School District. Remodeled and upgraded. Easy living, low housing costs! Price reduced to sell at $8,900. Possible lease to own option with $1000 or more down payment, then about $200/mo for about 4 years. You also pay lot rent of $410/mo to the park, but after our contract is paid off in 4 years, that’s all you pay! (Of course, you also pay your own utilities) Why rent a house, or put down a big down payment and take out a 30 year loan, when you can own this one in 4 years for only $8900??! Call to see or ask details: 785-640-6399. See pics and details on Craigslist here.